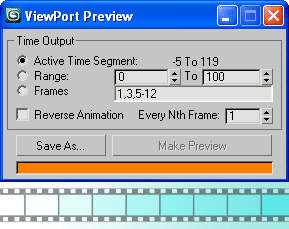 Capture Viewport animation to any output video/image format that 3ds Max support, with an access to the I/O bitmap setup (quality and compression settings), with a few (similar to the renderer) timing options. Now you can just type "-5 - 3" (or "-5-3"). Also using intervals (optional) made the input more clear. "-15 - -10" is more readable than "-15--10". "-9 - -7, -5 - 2, 6, 9 - 11"
"-9 - -7, -5 - -2, 6, 9 - 11"
I saw a request about similar script that to end in various file formats with output compression access, i.e. for example, to end with small size movie instead of large uncompressed AVI's. Well, it's nothing fancy, the built in Max function selectSaveBitMap() just "fix" that. For more details read the usage notes below. Create a button or assign it to hotkey, menu, quad. Most features are self explaining (I hope). 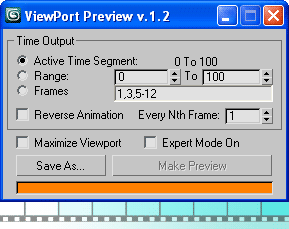 "Make Preview" button is disabled until set output file. Use "Save As..." to choose directory and output file format. Max will bring up it Setup dialog for compression settings. -- The order of values is not important in comma sequence 'cause the script auto sort the string, e.g. "0-3,8,4,-2" will be sorted and goes out as "-2,0,1,2,3,4,8"
Submitted by Anubis on Tue, 2011-10-18 17:49. Hey John, sorry for the bad news but the only way to "set" the view-port size is via gw.setPos(), and it actually create new GW (Graphic Window) which "works" (awesome broken feature). Submitted by JokerMartini on Tue, 2011-10-18 16:02. Submitted by Anubis on Wed, 2011-06-15 19:20. I read your comment on my Grab Viewport Plus and see that you finally find what you looking for ;) About the GIFs - yes, not supported. Submitted by Violet on Wed, 2011-06-15 09:41. Worked great, saving separate images to animation frames is what I was looking for! Thanks! Submitted by Violet on Wed, 2011-06-15 09:30. Submitted by Anubis on Tue, 2011-05-31 14:10. Submitted by W DIGITAL on Tue, 2011-05-31 11:38. - would you have time to make a checkbox, that when checked makes a preview in the project folder where the .max file is sitting, with the scene name plus _001 incremenation at the end? that would be great if it could automatically name the previews as the scene name! Submitted by JokerMartini on Tue, 2011-05-31 11:20.
anyway you could get the resolution to take into account the render output size? Submitted by pifitas on Tue, 2010-05-04 05:21. Submitted by Anubis on Tue, 2010-05-04 04:30. Hi Pifitas, yes, I see your point and update the script. Now you can interrupt it at any time by pressing Escape.